Florida National University offers Jimmy John's employees and customers the opportunity to earn a “Freaky Fast Track to Higher Education” Scholarship. Today Florida National University (FNU) announced a new partnership with Jimmy John’s Gourmet Sandwiches. 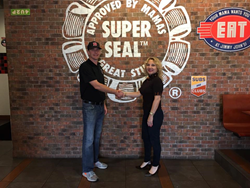 FNU Community Relations Director Rachel Tourgeman presented Jimmy John’s Franchise Owner Chad Bennett and the Hialeah franchise location with a scholarship opportunity, titled the Jimmy John's “Freaky Fast Track to Higher Education” Scholarship. This scholarship will allow one employee or customer from the restaurant to open the door to his/her future by pursuing higher education at FNU. Florida National University aspires to contribute to the education of a population of diverse cultures, providing educational and cultural programs intended to enrich the community it serves. Similarly, Jimmy John’s prides itself on its loyalty to people, the community, and to building America. In light of Bennett’s philosophy of ‘doing well by doing good,’ the Jimmy John’s franchise owner and FNU will honor his mentors and best friends, Roderick and Lucy Petrey, by dedicating the “Freaky Fast Track to Higher Education” Scholarship to them. If you have any interest in joining with Florida National University to help your business and employees grow with higher education, please contact us at: (305) 821-3333 to speak to someone today! If you are in need of a delicious, freaky fast sandwich, make sure to visit Jimmy John's at 1295 W. 49th St. Hialeah, FL 33012. Chad Bennett received a Bachelor's Degree in Aeronautical Science from Embry Riddle University. In the past, he worked Morgan Stanley, a global financial services firm and a market leader in securities, asset management and credit services. After working for years in finance, he proceeded to work for a non-profit titled the Collin Center for Public Policy. Finally, after much research and dedication, Bennett opened his own Jimmy John's franchise two years ago. The franchise continues to do well under his leadership, as his direction brings in many guests into the restaurant.